Join us at the Stoughton Library for two open forum talks in April about the benefits of Conscious Breathing. Learn how a fully Connected, Open Breath can support YOU in all aspects of your Life. A new topic will be presented each week in an open forum with Q & A followed by a short Breath exercise. Discover how the power of the Breath awakens one not only to greater physical health but Spiritual Wholeness as well. Breath and SpiritTM is not a religious course, it is about exploring and experiencing our multi- dimensionality; bringing the physical, mental, emotional, and Spiritual together leading us to our innate Wholeness. Spiritus is the Latin word for breath, and spiritual seekers throughout the world – including Western mystics, Indian yogis, and Taoist sages — have known for millennia that breathing is a pathway to higher levels of consciousness. If you’re like most people, however, you probably don’t realize that you’re not breathing to your full capacity or how this limits not only your physical energy and quality of life but also your ability to access the deepest spiritual levels of your being. In five powerful Transformational Breath® sessions, during this weekend, you will be guided in releasing and integrating long-buried, unconscious blocks of anger, fear, and grief. You will open energy centers in your body, leading to deeper states of peace and joy. No prerequisites for this Event. Wear comfortable clothing that doesn't restrict breathing. Mats and blankets will be provided. Please bring 4 pillows and a blanket. Early Bird: $299 by February 1, 2019 (Regular $375) (Does not include meals or lodging.) You will have to option to purchase boxed lunches for $15 on Saturday and Sunday. Can't make it to the whole weekend? Come Friday night - see separate registration. Coming from East or West: Traveling from I -10, Exit Sunland Park and turn left at the light. Go down a few blocks, and turn right on DONIPHAN. Then, turn left on Frontera Rd. 4 or 5 big blocks, you will find Mt. West Montessori on the right. There is plenty of parking. Welcome! Best Western Sunland Park Inn. Extended Stay America Holiday Inn El Paso West Sunland Park. All within the range of $60-$85 per night and all on Sunland Park Drive. Visit My Transformational Breath® webpage. Join us at the Stoughton Library for this 3 week series of open forum talks about the benefits of Conscious Breathing. Learn how a fully Connected, Open Breath can support YOU in all aspects of your Life. A new topic will be presented each week in an open forum with Q & A followed by a short Breath exercise. First Wednesday of every month at 10:00 a.m.
To create a haven of fellowship within the Community of Breathers and Breathworkers. Open to anyone who has previously had a full private session with Valerie, or is currently a Certified Transformational Breath® Facilitator. Only 4 slots available! Must reserve online. 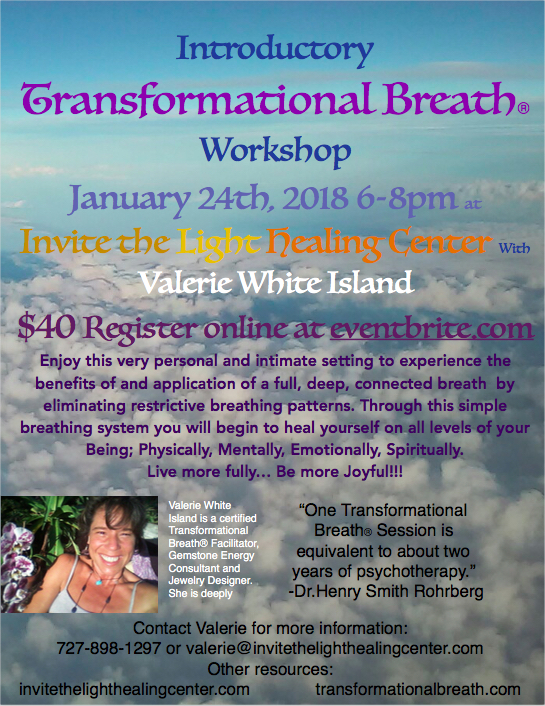 Free and open to anyone who has previously had a full private session with Valerie, or is currently a Certified Transformational Breath® Facilitator. Experience the benefits and application of a full, deep, connected breath by eliminating restrictive breathing patterns. Through this simple breathing system you will begin to heal yourself on all levels of your being: Physically, Mentally, Emotionally, Spiritually. Live more fully... be more joyful! For your comfort, please wear loose clothing, and bring a mat, two pillows, and a blanket.